With its natural extracts and extraction technology, Eco Treasures aims to provide high-value, high-quality products and services. Flexibility, reliable supply and technological support are key concepts for us. As raw materials, we use both primary raw materials and by-products (secondary streams) from other processes or industries. Eco Treasures has a strong focus on research and development of innovative extractions. We can support, design or execute the process from the laboratory stage to industrial production. Development of industrial extraction processes for third parties. Quality and yield comparisons between different extraction technologies. increasing yields, optimising energy consumption. Design of pilot and industrial plants. 2006 – Eco Treasures was launched with the goal of using innovative and sustainable technologies to extract high-value molecules from natural raw materials. During the early years, a lot of time and money was invested in researching and designing a supercritical pilot installation. 2008 – The first supercritical pilot installation for developing extraction processes came into use. 2010 – It quickly became clear that Eco Treasures needed to differentiate itself from other extraction business in order to win a place in the market. With this insight, the company developed a strategy to focus on niche markets and the valorisation of organic secondary streams from other industries. This was the step of the commercialization of commercialization of our first fruit seed oil, raspberry seed oil. Similar fruit seed oils followed shortly for which the raw material always came from the pulp of the fruit juice industry. 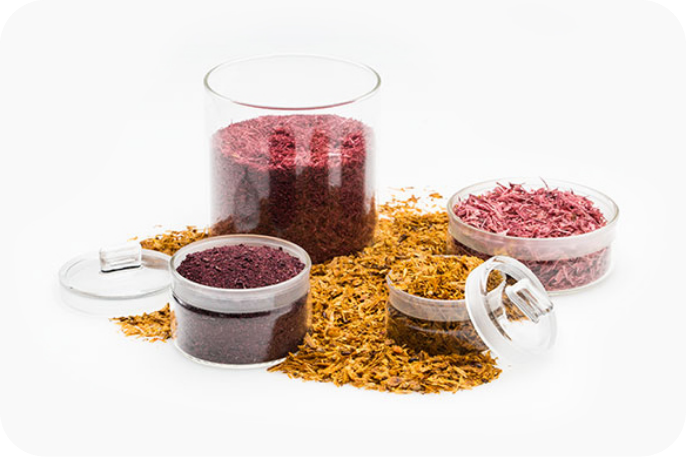 Since then, Eco Treasures has expanded its production to include a wide range of fruit seed oils and derivative products, such as fruit fibres and fruit seed flour. Hereby minimizing waste and maximizing added value. Besides its product range, Eco Treasures also offers an extensive technology portfolio. (Potential) customers who wish to isolate added-value products from their organic raw materials can rely on our experience and equipment. 2011 – Eco Treasures received organic certification for its products and supercritical extraction installation. The same year, the company was awarded the ISO 9001:2008 certificate. 2013 – Since the end of 2013 Eco Treasures has had a lab installation for supercritical extraction with carbon dioxide (CO₂) as the solvent. 2015 – Eco Treasures receives GMP certification for animal feed from the Feed Chain Alliance. Eco Treasures’ employees combine the needs of an innovative R&D organization with the requirements of an efficient, quality-focused production company. Our team consists of engineers, chemists and process operators with technical and scientific experience and know-how. Together with our logistics and quality support, we ensure that we can produce efficiently and supply high-quality products. Our engineers and scientists make it possible to develop extraction processes on a laboratory scale and to upscale them to industrial production volumes. Moreover, we keep all the options open, from the use of our installations to being commissioned by a customer to design a new installation. And of course, this all takes place under the strictest confidentiality. With Eco Treasures, our customers know that their process is in safe hands. Would you like more info about Eco Treasures as a business, our history or our strategy?